Sierra Club BC’s education programs are off to a great start! This past month I had the opportunity to travel to northern BC for a week and teach programs in the communities of Prince George, Vanderhoof and Burns Lake. One of my favorite aspects of this eco-province known as the sub-boreal interior is its vastness of trees, lakes, rivers and mountains. Traveling between the communities I experienced a feeling of remoteness that is hard to find when living in close proximity to one’s neighbors. For some students living in these communities their connection to nature is through their favorite activities, including fishing, hunting, mountain biking, hiking, snowmobiling, picking wild berries, gardening and farming with their families. Some of the activities that people in northern BC know best are those that take place in winter. Well, snow was in the air and winter was arriving to the northern communities the same time as I was. Snow coming down on my windshield as I drove to Vanderhoof was a reminder of this anticipated season and its potential for amazing outdoor fun. I am happy to share that the schools in these communities put a real emphasis on getting kids outdoors during the cold winter months. 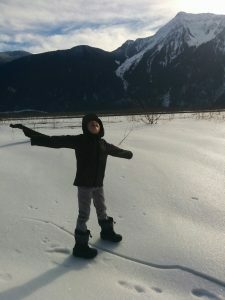 Winter activities such as cross-country skiing and snowshoeing are ideal ways to teach kids concrete skills and see the benefits of taking them outside. Sometimes though it can be challenging to get students into nature when the temperatures dip low. It is important to prepare your students by taking the time to talk about appropriate outdoor clothing for staying warm and dry. Once you have your students outside it’s important to encourage them to keep moving in order to stay warm. Plan activities that will keep them engaged and active. Remember, if you are feeling cold and anxious to get back inside, your students will be as well. Stay positive. Positive experiences are what count. You are always striving for safe and happy students with every outdoor experience. One idea for encouraging time outside is to keep your outdoor time short at the beginning of the winter (15-20 minutes at a time). You can always build up your time spent outdoors over the season. Take the time to learn about what your students are interested in experiencing this winter. What skills do they already have? Embrace the season by playing in the snow and asking questions about the weather and time of year. 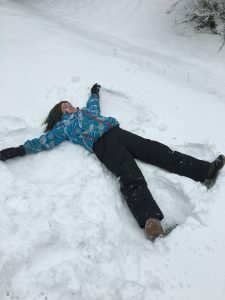 What do your students like most about the winter? About snow? Although it may not be everyone’s favorite time of year, winter does bring a lot of possibility for unique and memorable outdoor adventures. A highlight of my trip took place at a school just outside of Vanderhoof where I was able to take the students into a big forest where fresh snow had just fallen. We explored the nearby nature with a biodiversity scavenger hunt and experienced the variety of life in this ecosystem. Students came back full of stories. They found birds making their nests up in the trees and spiders’ webs hiding in bark. They discovered bracket fungus growing on the birch trees that grow in their forest. I was, as always, amazed by their knowledge of their home and what they believe is the most important part of this place: the trees, birds and animals that live here! These children are connected to their home through nature, so let’s continue to nurture them in this place they love so much by being stewards and role models of how best to protect our environment. Let’s encourage this generation to see themselves as caretakers and stewards of nature and support this special time as they build a relationship with their home place. Learn about the other ecoprovinces in British Columbia by using our EcoMap.